A Georgia native, Dr. Rosie first discovered her passion for animal care growing up on a small farm. 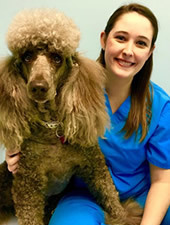 She began working as a kennel assistant in high school and worked her way up to the position of veterinary technician while in college. She attended Georgia Gwinnett College, where she received her Bachelor of Science degree. She completed her Doctorate of Veterinary Medicine at Ross University and acupuncture certification at the Chi Institute. Dr. Rosie has a special interest in integrative medicine, radiology and internal medicine. Outside of work, she enjoys traveling, camping, scuba diving, cooking and trying new foods. She lives in Lawrenceville, Georgia with her three cats, Trax, Slevin and Apricot.